Please join us for a Beginners Fly Tying Class on Saturday, February 16, 2008 from 11:00 AM till 2:00PM. It’s an introductory fly tying class that focuses on Maryland fly patterns. One of our Maryland river guides will be teaching this fun-filled beginners class. Cost of the class is $45 per person, and includes the use of tools and materials. The class is limited to six and pre-registration is required. Please give us a call at 410-329-6821 or drop us a line at info@backwaterangler.com to pre-register. This entry was posted in events on December 31, 2007 by Theaux Le Gardeur. 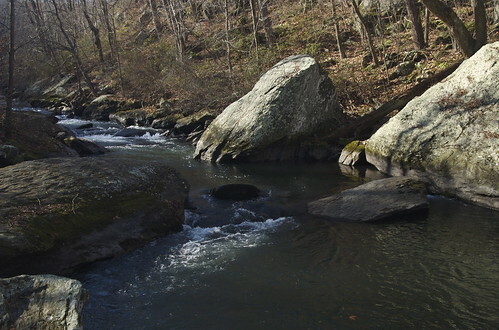 If you’re within two hours of the Gunpowder river, make fly fishing the Gunpowder your New Years’ resolution. We’ll be here New Years Eve and New Years Day From 10 AM till 4PM. We are selling 2008 fishing licenses, so be sure to bring check or cash along with you for the license. We can put any gear you need on a card. The Big Gunpowder Falls river is 43 F, very low at 20 CFs at Falls Rd and clear. Further downstream at Glencoe, the river is flowing at 86 CFs. Little Black flies have beeen coming off above Falls Rd since mid -week. Long leaders ending in 7x along with RS2 patterns and CDC midge emergers in the #20-22 range are a good bet. Further downstream, Prince nymphs in the #14-16 range should work fine. If you’d like to wade and not rock hop, the stretch between Monkton and Glencoe is worth the walk. If you’d like to have any easier time out there stop in and we’ll show you a few non-traditional Gunpowder streamers that should work great through the log jams and draw you a quick map of access points along the Gunpowder river. This entry was posted in fishing report on December 30, 2007 by Theaux Le Gardeur. Eden cane has quite a following in Japan where fly fishing for yamame and cherry salmon is very popular. For more information on these fine rods available at Backwater Angler from Bernard Ramanauskas including the Scott SC rods and Eden Cane rods. Be sure to check out our online catalog bamboo fly rod descriptions and Scott SC bamboo fly rod reviews. Read a review by Theaux Le Gardeur on the Scott SC 6′ 11″ 4wt. Read a review by Theaux Le Gardeur on the Scott SC 7′ 5″ 4wt. Please give us a call at 410-329-6821 or drop us a line at info@backwaterangler.com to inquire about availability and delivery of Scott Bamboo and Eden Cane fly rods. This entry was posted in news, reviews, video on December 23, 2007 by Theaux Le Gardeur. A pocket water dream. Tie on a big hairwing dry and get ready to smile! Backwater Angler received the first production Scott SC bamboo rod from Scott Fly Rod Co. built by Bernard Ramanauskas in 2006. We lawn cast this rod upon delivery and found that the Scott SC 6′ 11″ 4wt rod is wonderfully balanced, crisp in action and beautiful in every aspect. This entry was posted in gear, reviews on December 23, 2007 by Theaux Le Gardeur. An all rounder with no equal- Fish small dries on hand-tied leaders or swing a brace of wets and hold on! The last time we received a Scott SC 7′ 5″ 4wt rod at Backwater Angler the second guy that cast it took it home. Having lawn cast the rod, with both gentleman, (one was certainly luckier than the other) I was most impressed with how quick and light the rod felt in hand and how accurate it was in the short to medium distances. Please join us for a Beginners Fly Tying Class on Saturday, March 15, 2008 from 11:00 AM till 2:00PM. It’s an introductory fly tying class that focuses on Maryland fly patterns. One of our Maryland river guides will be teaching this fun-filled beginners class. Cost of the class is $45 per person, and includes the use of tools and materials. The class is limited to six and pre-registration is required. Please give us a call at 410-329-6821 or drop us a line at info@backwaterangler.com to pre-register. This entry was posted in events on December 22, 2007 by Theaux Le Gardeur. Please join us for an intermediate Fly Tying Class on Saturday, March, 8 2008 from 11:00 AM till 2:00PM. It’s a fly tying class that focuses on Gunpowder river streamer patterns. One of our Maryland river guides will be teaching this fun-filled intermediate class. Cost of the class is $45 per person, and includes the use of tools and materials. The class is limited to six and pre-registration is required. Please give us a call at 410-329-6821 or drop us a line at info@backwaterangler.com to pre-register. Join us on Saturday, March 1, from 11:00 AM till 2:00 PM for a Chesapeake favorites tying class that focuses on Chesapeake Bay fly patterns. Capt. Jeff Lewatowski will be teaching this class for intermediate tyers. Cost of the class is $45 per person, and includes the use of materials, please bring your own tools.The class is limited to six and pre-registration is required. Please give us a call at 410-329-6821 or drop us a line at info@backwaterangler.com to pre-register.